The City of Woodinville, located northeast of Seattle and an easy, 90-minutes-or-less drive from the North Sound, has become a mecca for Washington wineries. Alyssa Lilequist, Director of Marketing for Woodinville Wine Country, estimates that over 110 winery tasting rooms are located in and around the City, with 70 of those using the area for their production facilities as well. But here’s the cool thing about the Woodinville: it’s not just for wine enthusiasts. With plenty of breweries, distilleries, and restaurants also nearby, the City has broadened its appeal for those looking for a day-trip, weekend, or extended-stay destination…with wine tasting at its center, of course. The diversity of wineries in Woodinville – from boutique to family-owned to Eastern Washington-based large-scale producers – practically guarantees a “something for everyone” tasting experience. One of area’s original wineries, Chateau Ste. Michelle, is also the state’s largest. 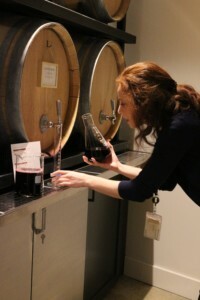 It offers a sleek, spacious tasting room along with a number of wine-related activities such as the “Art of Blending Experience.” Hosted by Wine Educator Laura Kasser in an informal classroom setting, participants can customize their own red blend from six Bordeaux varietals and take a finished bottle along with them. Pam Adkins, Winemaker/Owner at Adrice Wines, worked at several wineries including Ste. Michelle, Oregon’s Rex Hill, and Napa Valley’s Orin Swift before opening her winery near Woodinville’s Warehouse District in 2016. Her cozy, slightly-off-the-beaten-path tasting room is a welcome respite from some of the area’s larger venues. Adkins has an affinity for Italian varietals and likes to work with them on a stand-alone basis whenever possible. Try her 2016 Nebbiolo, an earthy, smoky Old-World style red she refers to as her “pizza wine” or the 2016 Montepulciano, a rare-to-Washington varietal with delicious bright cherry flavors and a slightly chocolatey finish. 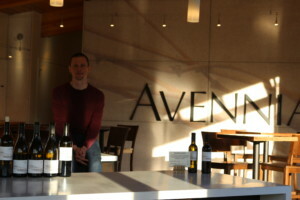 At nearby Avennia, winemaker Chris Peterson (who’s also consulting winemaker for Passing Time Winery) draws on some of the state’s finest vineyard sources such as Red Willow, Boushay, Dionysus, and Bacchus for his wines. Red wine lovers will also enjoy a visit to JM Cellars, where husband-and-wife owners John and Peggy Bigelow with greet you with a smile and plenty of stellar, handcrafted wines. John’s winemaking philosophy is remarkably simple: “a good recipe, fresh ingredients, cleanliness, and experimentation over time.” The Bigelow’s success can be measured by both a large and loyal wine club and the fact that virtually all of their sales are done from their Woodinville tasting room. Lounge on patio, play a game of bocce ball, or take a stroll through the winery’s private arboretum and enjoy a glass of JM Cellars’ crown jewel, the newly released 2016 Tre Fanciulli. This blend of Cabernet Sauvignon, Merlot, and Syrah, sourced from Red Mountain’s Klipsun Vineyards, is packed with juicy black cherry fruit, nuances of minerality, and great finishing acidity. And for those who might enjoy a little art with their wine, a stop at Woodinville’s Pondera Winery is a must. The winery shares a space with Howard/Mandville Art Gallery and features a collection of excellent wines from Shane Howard with unique, eye-catching wine labels. Growing up in the Pacific Northwest art community, the self-taught Howard equates this experience with making his wines: “I think of it as more of an art, and blending is how I put my signature on the wine.” His 2014 Entourage is a perfect example; a tasty blend of five Bordeaux red varietals that displays depth, character, and balance. White wine drinkers will also enjoy the Pondera 2017 Chardonnay and the 2017 Viognier, a stainless steel-fermented mouthful of peach and stone fruit flavors that’s absolutely delicious. Who wants to waste valuable time eating when there are so many wines to taste, right? Well, you might want to rethink that strategy after a stop at a couple of Woodinville’s fine dining establishments. In addition to outlets in downtown Seattle and Bellevue, the Purple Café is a great venue for either lunch or dinner in the heart of Woodinville Wine Country. 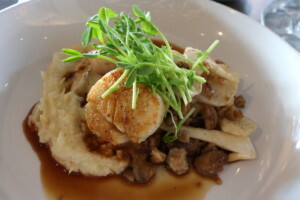 The menu includes a well-rounded selection of salads, sandwiches, flatbreads, and pastas and the Pan-Roasted Filet Mignon is a larger-than-expected, cooked-to-perfection choice served with truffled polenta, mushrooms, and porcini butter. Where Purple really shines is its list of wine flights; three 2.5 ounce pours of reds, whites, or mixed trios, many of which include current releases from local wineries. Heritage Restaurant and Bar is a favorite with the Woodinville locals…and with good reason. Chef/Owner Breanna Beike has created a venue that’s welcoming and immensely satiating, with moderate prices and lovingly prepared attention-to-detail culinary choices that will make this your go-to place for dining while visiting the area. Beike is a self-proclaimed “seafood and vegetables girl,” and it shows. These two menu staples, served always at their freshest, are included in selections such as Oysters with Shallot Thyme Mignonette, Lemon Chili Sauce and Horseradish, or Caramelized Sea Scallops with Parsnip Purée and Turnips. The simplest touches such as the creamy/dreamy, Saffron Aioli make a delicious, half-pound Heritage Burger with hand-cut fries even better; an extraordinary house salad with locally-grown greens includes crumbled French feta cheese, honey almonds and a flavorful, pomegranate-hazelnut vinaigrette. And be sure to save room for Beike’s completely-over-the-top desserts. Recent choices, including House-made Chocolate and Salted Caramel Ice Cream and the amazing Pie in a Jar – key lime curd, graham crackers and toasted marshmallow – were sublime. There aren’t many hotels that carry a Woodinville address, so you may have to look to nearby Bothell, Kirkland, or Redmond for overnight accommodations. There is, however, one hotel that, simply put, is the place to stay when visiting the wine country. Willows Lodge is an 84-room property located just across the street from Chateau Ste. Michelle. The rooms are spacious and warmly appointed and each includes an amazing list of amenities such as a gas fireplace, soaking tub, patio or balcony, fully-stocked mini-bar, and 24-hour room service. 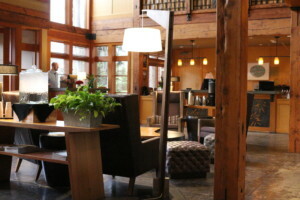 The Lodge also features four outdoor patio gardens, drinking and dining options at the Barking Frog restaurant or Fireside Lounge, and an in-house spa and sauna. The friendly staff and impeccable service may tempt you to linger at the hotel. Just remember, there’s a whole world of other things to do in Woodinville Wine Country that are certain to make your visit a memorable one.